The Master of Public Health (MPH) Online program at USC offers a rigorous curriculum that attracts dedicated and ambitious professionals with a passion to serve in the public health arena. The program’s core coursework aims to develop your key public health competencies and skills through the use of cases and examples from industry — ranging from local to global. Historical development of the American health care system, determinants of health care utilization, role of health care providers, health policy, public health services and health care finance. Terminology/uses of epidemiology and demography, sources/uses of population data, types of epidemiologic studies, risk assessment, common sources of bias in population studies and principles of screening. The MPH online program practicum combines field training with a leadership seminar and capstone course. With the help of your practicum advisor, you’ll select a public health agency within your desired geographic location (domestic or international) — such as a health department, community-based organization or research center — and you’ll practice leveraging what you’ve learned in a guided, hands-on experience. Then, in the capstone course, you’ll write a research paper, often related to what you do for your field training, on the competencies you’ve built throughout the program. *Practicum units are intended to be taken concurrently. Field placement in a public health agency, such as a county health department or community-based organization. Introduction to business and management concepts, tools and practices in the context of domestic and global health care delivery, public health and allied health industries. Provides the culminating, integrative curricular experience for students during their last semester prior to graduation. Course draws on students’ prior training in the five core areas of public health, their additional track coursework and their real-world experience gained in the field prior to graduation. Designed to challenge students to reflect and integrate their training and experience with the goal of developing their own individual point of view regarding the role of public health in contributing to the improvement of the health and well-being of populations in the United States, as well as abroad. 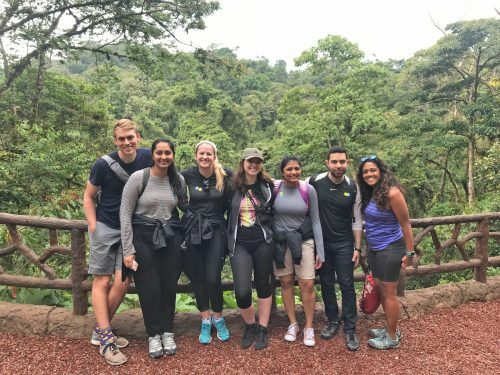 Students in the USC Master of Public Health Online program are encouraged to participate in our unique faculty-led international trips (usually two weeks). These opportunities offer hands-on public health experience in clinics, government organizations, non-governmental organizations, research institutes and in communities around the world. Students can earn course credit for the two-week faculty-led trip and, if desired, set up a practicum and extend their time in the country. Through our expert faculty, opportunities have been made available to students to work in Costa Rica, Switzerland, India, Ghana, Honduras, Mozambique, Mexico, Chile, Taiwan, China, Singapore, Panama, Japan and more. 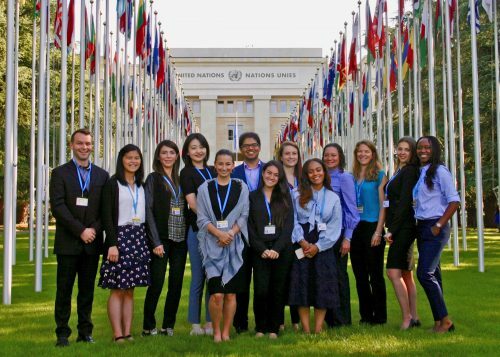 As an example, our course in Geneva investigates the way health is organized and administered at the global level by integrating students directly into the World Health Assembly (WHA), the decision-making body of the World Health Organization, and exposing them to the inner workings of key global health organizations. In Panama, students develop skills in implementing qualitative and/or quantitative research methodologies and health interventions in a community field setting. Students receive hands-on community experience by engaging with diverse organizations and communities: local health clinics and hospitals; a public health research institute; a local high school participating in nutrition and vaccine promotion efforts; field visits to local public health agencies and NGOs; and a day tour to an indigenous community living in a protected area of Panama. Such opportunities are one of the unique advantages offered by USC’s Online MPH—unparalleled by other online programs. We’re talking a lot about NCDs and probably everyone is. Can you talk to me a little bit about the US position on NCDs here this week? Sure. We’ve been parked for a couple of years on raising the awareness and engagement of WHO in noncommunicable diseases. It actually, while it’s thought of in the United States to have something to do with wealthier nations, actually it’s a huge emerging problem in developing countries also. High rates of diabetes, high rates of heart disease, smoking issues, preventable deaths are actually something that developing countries have a great deal of interest in. So this meeting will actually be coming up with some initial recommendations around where WHO wants to focus their time and attention. We had a first conversation about this in Moscow about a year and a half ago. A working group has been on the way, and at this meeting, I think the initial recommendation about 2 or 3 areas, we know there’s a lot of agreement about going after tobacco use and smoking reduction. It’s kind of a great bang for your healthcare buck. Probably the best public health initiative. We think there’s a lot of agreement around diet, particularly as it regards sodium, and lowering sodium content, dealing with a lot of these underlying degrees, and probably around exercise and nutrition also. So there’s likely to be a lot of consensus of those or places that we all can start our efforts, but then continue on from there. The challenge with developing countries, is they now have to deal with NCD’s and infectious diseases at the same time. So help and technical support is also gonna be part of this issue. Project Description: This course focuses on the intersections between planetary health and human rights. Participants will visit three locations in Costa Rica to examine broad social and environmental challenges such as migration, water sanitation and hygiene, climate change, sustainable development, biodiversity loss, and human rights. Hi, my name is Will Jardell. I’m an USC Masters of Public Health student online with a concentration in Global Health. I currently live in Los Angeles, California. There are so many ways to get involved in the online program. I found out about a global health trip through an e-mail, and this summer I went to Costa Rica for two weeks with Dr. Kumar and Dr. [Wither 00:00:19]. There were online and on campus students on the trip. We learned about indigenous populations, we learned about climate change initiatives happening in Costa Rica. We also learned about the human rights court located in San Jose. One thing that I really loved about going to Costa Rica was being able to communicate and learn from the indigenous population. We got to learn about the struggles, the challenges, and the things they’ve had to overcome in Costa Rica. Another amazing part about going to Costa Rica was being able to experience it with the faculty of USC. We got to learn from them, their experiences, and get a real time view of the things they’ve learned throughout the public health field.